Composite photograph of the members of the 1904 Brandon Fire Department. Pictured are: J. Poole, N. Currie, J. Melhuish (Captain), J. Waterson, F.A. Harper, A. Partridge, M.P. Say, A.R. Crawford (Engineer), D. Gallagher, L.M. Armstrong (Secretary), J. Wells, J. Henderson, F. Wells, E.G. Wiswell (Chief), J.R. Craig, J.S. Hall, J. Jakson, C.T. Laidlaw, Geo. Wrye, D.J. Anderson, J. Stokes, H. Wills, P.C. Collins, D.A. Sutherland (Hose Foreman), J.F. Barber, C.M. Crofton (Ladder Foreman). 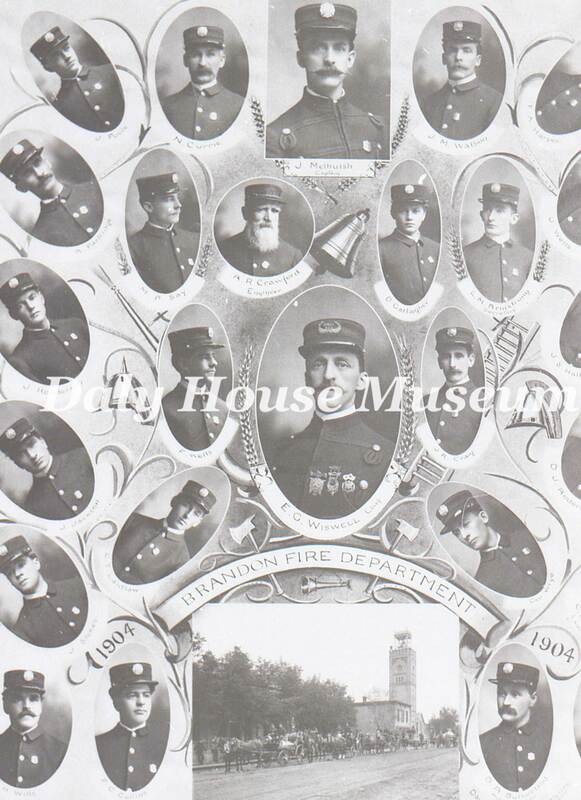 Inset photograph of horse-drawn wagons and ladder with the original Brandon Fire Hall at 7th Street and Princess Avenue in the background.